Conservationists from the University of Nevada are increasingly finding oversized goldfish in Lake Tahoe— and they're attributing it to the practice of aquarium dumping. The hardy goldfish, a relative of the asian carp, can grow to 1.5 feet or longer, and they're starting to become a menace to the lake's ecosystem. And as the biologists warn, it's a growing problem that's global in scope. According to a recent report by NBC affiliate KCRA-TV, invasive goldfish are likely being dumped by aquarium owners. The Lake Tahoe conservationists have been scooping as many as 200 normal-sized goldfish at a time, but they were taken aback when they caught their first monster version. 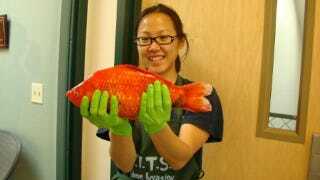 "You just see this bright golden orange thing starting to float up and you're like, 'what is that,'" said researcher Christine Ngai, "and then you take a net and scoop it up and start to realize it's a goldfish." Team member Sudeep Chandra, an associate professor at the University of Nevada, Reno, said they're finding as many as 15 oversized fish in concentrated areas. The conservationists are currently trying to figure out how long these fish have been there, and in what quantities. In January, Becky Oskin of OurAmazingPlanet.com, citing a University of California, Davis, report on California's aquarium trade, wrote that numerous invasive aquarium species are dumped in the wild every year. "Globally, the aquarium trade has contributed a third of the world's worst aquatic and invasive species," Sue Williams, an ecology professor at UC Davis and lead author of the report, said at the time. In a 2006 report on aquarium dumping, Fox News wrote that while pet fish, mollusks and other species are wreaking havoc in domestic water bodies, the beloved goldfish is the animal that is "most frequently released and can do some of the worst damage to native fish species." "Oftentimes people think, 'Well, gee, if I just dumped in one fish, that's not going to make a difference,'" Pamela Schofield, an ecologist at the U.S. Geological Survey, told the news agency. "But it can with goldfish because of the way they eat — they root around in the sediment and that suspends the sediment up in the water." This, wrote Fox News, "leads to murky water, destroyed vegetation and water turbidity." We've said this many times before, and we'll keep saying it: Never dispose livestock, substrate, and aquarium water into lakes, ocean, or waterways! It doesn't matter if you think it's "just water" or one little fish or algae. ABSOLUTELY NO EXCEPTIONS!